To achieve the results you want when you install your new lawn, whether residential or commercial, you’ll need accurate measurements of your yard to give to your turf contractors. As Sydney turf suppliers, we’ve seen first hand how much more difficult laying turf becomes without accurate measurements. So we’ve provided these simple instructions to help you get turf supplies in the quantity you need by getting correct measurements. The simplest way to measure your yard is to draw up a diagram, break it into simple shapes, then stake out those shapes and measure their sides. 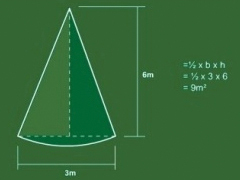 Once you’ve got the area of each shape in metres squared, you simply add them together and you’re ready to order your turf supplies. Just remember to add 5-10% to your measurements – with turf supplies, too much is better than not enough. Squares are the singlest easiest shape to find the area for. 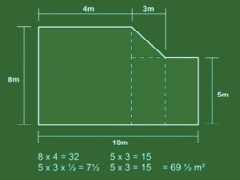 Just measure any side and multiply the number by itself to calculate the area. 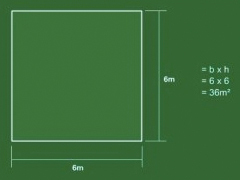 Rectangles are similar to squares except you need to measurements, the height and the width. Once you’ve got these, just multiply them and you’ll have the area. Triangles are slightly trickier. Measure the width, and the vertical height – that is, the height at a right angle to the base – multiply the numbers together, then divide by two. Sometimes you need to know how to work out the area for trickier shapes. If you need turf contractors for a sports oval, roundabout, or just a very irregular yard you’ll need the following formulas to get your measurements. You’ll need a calculator for this one, because it involves the irrational number pi (?). First measure the width of the circle and divide it by two. Now multiply that number by itself, and multiply the result by ? to get the area. For an oval or other ellipse shape, you’ll first need to measure its height and width. Now divide those numbers by two, multiply the results, and then multiply again by ? to get the surface area. For an irregular trapezoid area, you’ll need to measure the width of the top and the bottom, which won’t be equal. Now add these numbers together, divide the result by two, then multiply by the vertical height. Once you have the area of your yard, you’ll need to work out how much soil underlay you need in cubic metres. To get this information for your turf contractors, simply multiply the area you need turfed by the depth of underlay you want. Be sure to still use metres though, eg. 100 millimetres = 0.1 metres. Once you know what you need, contact Hi Quality Turf on 1800 887 258 or enquire online. We are superior Sydney turf suppliers – we deliver turf supplies to your door and provide expert advice on laying turf, caring for your lawn, and improving your soil.